Over thirty years ago I developed an extension handle for outboard motors that is now a national success, I sold the rights and it now sells by the name of "HelmsMate". As the original inventor of the HelmsMate, I asked myself what would I do differently to improve upon an already very successful design? The problem with today's outboard motor extension handles is they only serve one purpose and are specifically geared towards trolling motors of 15 h.p. or less, yet I see many boat owners using these handles on larger motors that it was not designed for. My new and improved MULTIPURPOSE model shares one extension handle with attachable accessories such as, a boat hook, fishing net, emergency paddle, gaff hook, and a deck brush, optimizing valuable space in your boat and it's INDUSTRIAL DESIGN allows it to be used on ALL SIZE outboard motors with tiller handles. 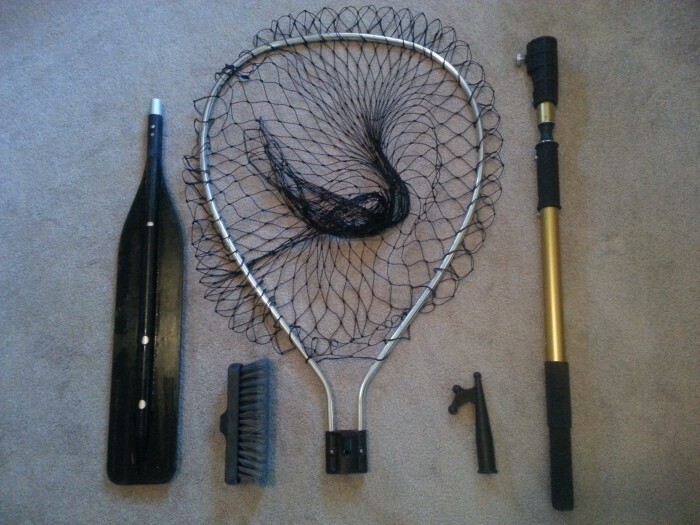 Individually, each of these aforementioned accessories have their own extension handle unique to their individual use that take up a lot of space in the boat and becomes very cluttered and unsafe to move about. Another unique and PATENTED feature of this new outboard extension handle was the FLEX JOINT that replaces the metal u-joint of my previous design found on the "HelmsMate". This new FLEX JOINT design provides for a much smoother throttling action and is not limited to any position while operating. The FLEX JOINT is also rigid enough that when you let go of the handle it remains in upward position that allows the operator to easily grab it when needed. The previous metal u-joint would fall to the deck of the boat and the operator had to reach down and pick it up. I also improved upon the u-joint LOCK OUT feature where as on the Helmsmate version there was always a bit of slop or wobble in the handle once the LOCK OUT was engaged. In my new design the LOCK OUT feature is very rigid and has removed all the slop or wobble of my previous design. Click on the link to watch my YouTube video of this working prototype in use. According to the National Marine Manufacturers Association (NMMA), the marine accessories market is a $16 billion annual market. I firmly believe that this Multipurpose tiller extension handle will create annual sales exceeding $1 million dollars. I am seeking to sell this patent outright or enter into a license agreement. I consider this to be a low risk investment, as I am the inventor of the highly successful Helmsmate that is currently being manufactured and sold world wide by Ironwood pacific. Marine accessories stores will naturally be interested in seeing and market this newer improved version. I am currently waiting to be awarded a second Utility Patent on another multipurpose invention that is in Patent Pending status. 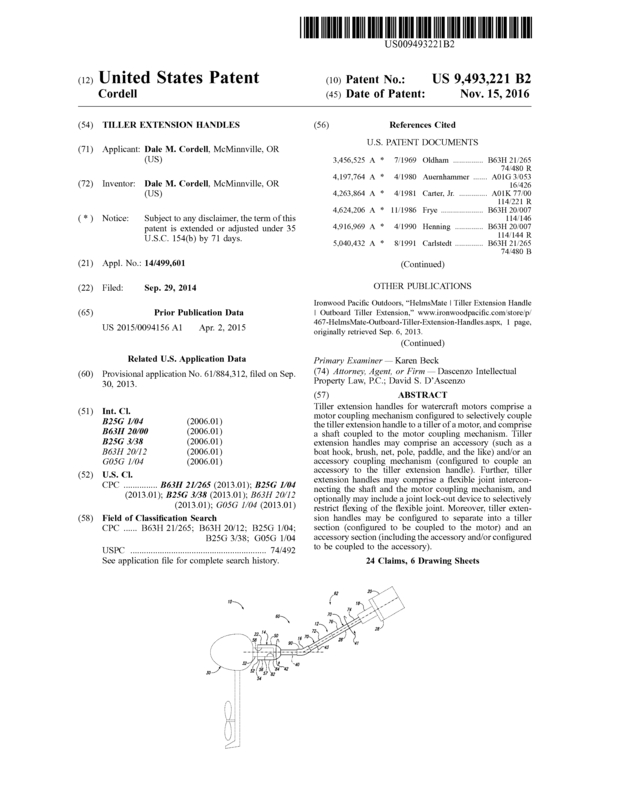 Page created at 2019-04-25 4:14:03, Patent Auction Time.